Lincoln preschoolers visited “LOTS of centers – FIVE of them” according to one boy walking from one classroom to another on Friday. 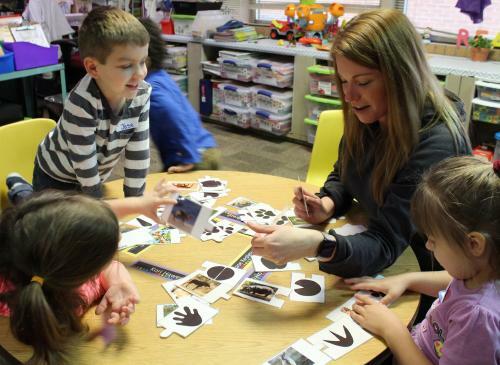 In a day set aside for hibernation-themed activities, the school’s teachers read stories, used videos, games and hands-on activities to explain how animals live outside in the winter while others find a safe place to sleep through the winter. Lucille Lord read a book about a dormouse trying to find a warm nest, a place to curl up in some soft grass and sleep away from the snakes and the hawks. Then they walked around the room singing a hibernation song. When the music stopped, the child who couldn’t find a rug to curl up and sleep on had to get inside the “bear cave” to hibernate. Sticky fingers awaited the students who went to Meagan Moyer’s class. There, the students focused on the birds who stay around Chanute all winter and what they eat. Using a plastic knife, the preschoolers spread peanut butter on toilet tubes and then rolled them in bird seed. 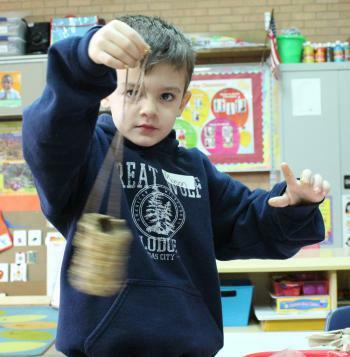 String was added to the homemade bird feeders so the children could take them home for their backyard. Animal tracks were the theme in Amanda Clasen’s room where the student’s learned they could recognize animals by their footprints in winter, in the snow or in the mud. At one table, students matched cards with animals on them to cards of animal tracks. Then, they attached the two pieces together like a puzzle to show each other. On another side of the room, the students picked out animal tracks that had been glued to the bottom of large flip-flops. Clasen painted the tracks, and the children stamped the prints to a long piece of butcher paper that was later hung in the school hallway. 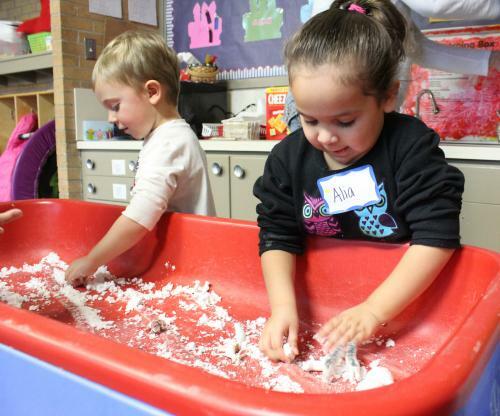 In Lisa Goracke’s room the students played with make-believe snow. At one small table they searched for small plastic animals hidden under fluffy white stuff concocted from baking soda and hair conditioner. At another, they used pails, shovels, cups and their hands to form snowballs, dig and mold things. Kim Luebbering talked about animals that live in the cold all the time and showed them where the Arctic is on the globe. They children learned about the kinds of coverings animals have – penguins have feathers – to keep them warm in the winter. “What about whales? How do they stay warm in the cold water?” she asked. She told them about blubber and how it protects whales and seals from freezing in the cold water. 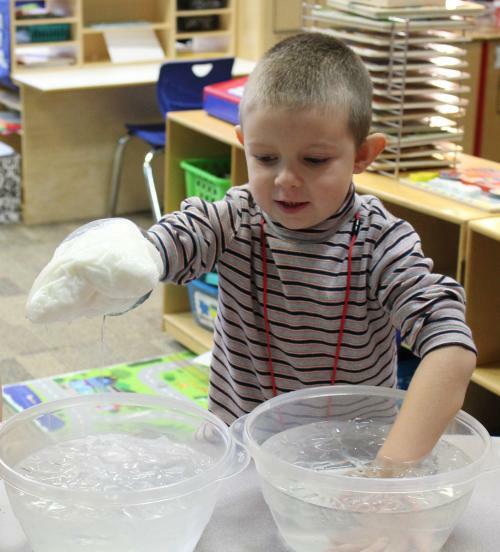 Then they gathered around a table to experiment with whether a glove of blubber (shortening) would keep their hand warm if it was placed in a bowl of water and ice cubes. According to the students’ squeals, the ice water on their bare hand was definitely cold, but not so much on the hand in the blubber glove.